Can human hair weave be permed? I'm a worker of Nadula Hair Company.We have made all kinds of virgin human hair from 2003.Many people who have bought from us also ask me this question: Can I perm my Brazilian hair weave? Can I perm my body wave Indian Hair? Now, I will tell you about this question. The hair weave is divided into two kinds, Synthetic hair weave or real hair(human hair) weave. Synthetic hair weave is not the hair, in fact, it is made of synthetic fiber which looks like hair, it's cheap and can't use for a long time. Most of all, it can't be permed, dyed, or treated with electric products. So the products we usually use is real human hair weave, the raw materials come from different countries, Like Brazil, Peru, Indian, Malaysia and etc. 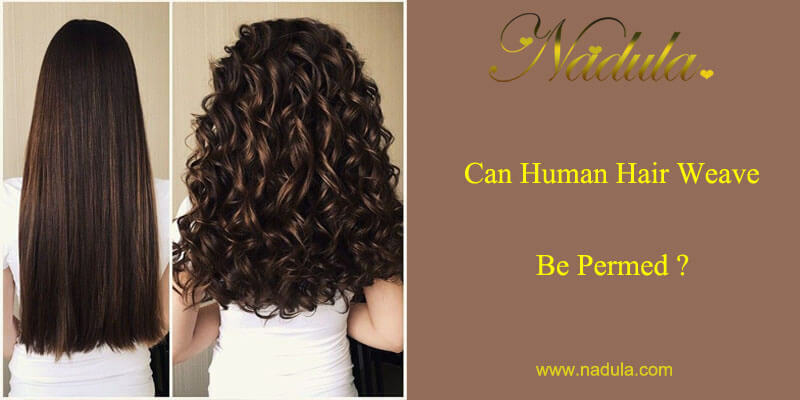 Nadula's human hair weave is made of 100% human hair which is cut from one donator, so our quality is recognized by customers from worldwide. Especially for African American women. The answer is YES.You can be permed, dyed, bleached it anyway.But be remember that all of the electric treatments with hair will cause varying degrees of damage. So you need be careful with maintaining it before perming and after perming it. How to perm your human hair weave? First, you need to deep clean the human hair weave with shampoo.Either cool or warm water is ok.Wash it gently but not rub it vigorously to avoid shedding.Then put it in the air to dry it naturally. Second, put some protective agent before perming it. This is the important process that can protect your hair and perm good result.Then you can perm with an electric iron. If your human hair weave is curly, you can straighten it with the flat iron. If your hair weave is straight, you can curl it with a curling iron. Finally, be remember to spray some nutritional agent on your hair which can be let your hair look shiny and beautiful.You should to wash and maintain it regularly to prolong the lifespan of the hair weave, also can save money for you to buy next one.Why not go ahead with it? Of course, you can go to a salon to ask for help if you are busy or can not perm by yourself.A stylist will be more professional to make your hair beautiful. There are many helpful things you may be interested in on Nadula.com.Go to check it freely.